From Middle English foteball; equivalent to foot +‎ ball, which may refer to the act of kicking a ball with the feet. (Britain, uncountable) Association football: a game in which two teams each contend to get a round ball into the other team's goal primarily by kicking the ball. Known as soccer in Canada, the United States, Australia, and New Zealand. (US, uncountable) American football: a game played on a field of 100 yards long and 53 1/3 yards wide in which two teams of 11 players attempt to get an ovoid ball to the end of each other's territory. (Canada, uncountable) Canadian football: a game played on a played on a field of 110 yards long and 65 yards wide in which two teams of 12 players attempt to get an ovoid ball to the end of each other's territory. (Australia, Ireland, New Zealand) rugby union. (slang, US, countable) The leather briefcase containing classified nuclear war plans, which is always near the US President. 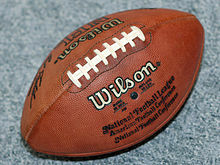 “football”, in OED Online ⁠ , Oxford: Oxford University Press, launched 2000. Category:en:Football (soccer) for a list of terms used in football/soccer. Football (word) on Wikipedia.Details of the word football in various parts of the world.